Get free and fast delivery on Quinny from BuggyBaby.co.uk. Designed for city slickers, BuggyBaby has an unrivalled selection of Quinny All Round Pushchairs , Quinny Carrycots, Quinny Changing Bags, Quinny Lightweight Pushchairs and Quinny Pushchair Accessories. Perfect for sophisticated urban parents with busy lives. BuggyBaby is an approved stockist of the Quinny range. Formed in 1950 by Nicolaas Quint, the Quinny brand stretches back decades. Part of the Dorel Group since 2001, Quinny shook up the pushchair market when it introduced its innovative sporty jogger in 1997. Today, Quinny is an established lifestyle brand that appeals to urban parents. Made for city living: the Quinny Zapp Flex Pushchair make kerbs, buses and trains a breeze to navigate. Products to fit your lifestyle: the Quinny Zapp Xpress Pushchair folds up really small - perfect for taking abroad. Stylish accessories: Quinny Pushchair Accessories are beautifully designed to keep baby warm, cool and comfy. Upmarket colours: Quinny All Round Pushchairs come in a range of beautiful contrasting shades to suit boys and girls. At 8.8kg, the Quinny Zapp Flex Pushchair is a lightweight pushchair that you will love taking around town. Suitable from 6 months - 3.5 years, the Quinny Zapp Flex Pushchair has three wheels for extra manoeuvrability and upturned handlebars for a more natural pushing position. Moreover, it has a two-way relax/recline mode when your baby wants to swap zapping for napping. For ease of use, the Quinny Zapp Flex Pushchair folds down without you having to take the seat off. Raincover included. Available in two great colours: Red on Graphite and elegant Frost on Grey. At just 7.6kg, the Quinny Zapp Xpress Pushchair is perfect for crowded play dates and coffee outings - simply pop baby on your lap and fold up your pushchair until you’re ready to go again. Stylish, lightweight and easy to push, the Quinny Zapp Xpress Pushchair will fit in the smallest of car boots and is great when travelling abroad. We love the super smart All Grey. Suitable from 6 months - 3.5 years: the Quinny Zapp Flex Plus Pushchair has four wheels with swivels to deliver the smoothest possible ride. Its two-way seat goes back flat while its closed push bar was made for one handed pushing. Moreover, the large shopper, extendable sun canopy and raincover make the Quinny Zapp Flex Plus Pushchair the perfect chariot for all-weather strolls. The Quinny Zapp Flex Pushchair, Quinny Zapp Xpress Pushchair and Quinny Zapp Flex Plus Pushchair are available at competitive prices from BuggyBaby. Wrap up your newborn in the super-soft Quinny From-Birth Cocoon. Available in subtle Sand or stylish Graphite, the Quinny From-Birth Cocoon fits atop your Quinny Zapp Flex Pushchair and Quinny Zapp Flex Plus Pushchair with an inbuilt harness to strap baby in. Comes with two soft blankets to ensure baby is kept snug on your first walks outdoors together. Check out our best prices on the Quinny From-Birth Cocoon at BuggyBaby. The elegant yet practical Quinny Changing Bag comes with everything you need to stay stress-free on a day out. It features a waterproof pouch, perfect for storing wet pants and nappies, plus a changing mat and insulated compartment to keep baby bottles warm. You can also swap the Quinny Changing Bag from backpack mode to shoulder bag thanks to the clever design of the two-way straps. The Quinny Changing Bag from BuggyBaby is a great gift for a mum to be. Quinny call the the Quinny Yezz Air Pushchair its travel hero and we can see why. This superlight weight pushchair weighs in at just 5.6kg and can be folded so small that it can be easily carried over your shoulder. As such, the Quinny Yezz Air Pushchair is perfect for airports, trips around town. The hammock fabric doesn’t just look cool - it’s made from a breathable web, keeping your baby cool as the mercury rises. Planning your next holiday? The Quinny Yezz Air Pushchair from BuggyBaby is the perfect travel companion. The Quinny Zapp X Airy Sun Canopy is the perfect fit for your Quinny Zapp Flex Plus Pushchair and Quinny Zapp Flex Pushchair. SPF 50+ sun protection on the solid areas of the canopy keeps baby’s delicate skin safely out of the sun’s glare, while mesh panels let fresh air through. You can also extend the sun sail - tucked inside - for full sun coverage. For simple sun protection, the Quinny Parasol is a great value bet. Simply clip on any Quinny All Round Pushchair or Quinny Lightweight Pushchair and go - keeps your child protected from the sun (UV40+) and the rain, too. Finally, if you’re travelling anywhere with mosquitoes, make sure to pack the Quinny Zapp Flex / Flex Plus Mosquito Net - and keep your baby protected from nasty bites. Protect yourself from downpours with the Quinny Zapp Xpress Raincover. It fits snugly over your Quinny Zapp Xpress Pushchair, creating a watertight cover while enabling baby to see out of the large transparent window. It’ll protect your baby from snow, too. Bought a Quinny Yezz Air Pushchair? The Quinny Yezz Raincover keeps baby dry and comes with a cute storage bag. Keep your Quinny All Round Pushchair well looked after and it will hold its value for years to come. The Quinny Travel Bag lets you zip up your Quinny Yezz Air Pushchair and your Quinny Zapp Flex Pushchair, making it easy to transport while protecting the frame and wheels from scrapes. Stay on top of the grocery shop with the Quinny Xtra Shopping Bag. This stylish mesh carrier that fits perfectly on the reverse of your Quinny All Round Pushchair or Quinny Lightweight Pushchair, leaving the storage space under the pushchair free for baby things. When it comes to parenting, it’s the small things that make the difference. 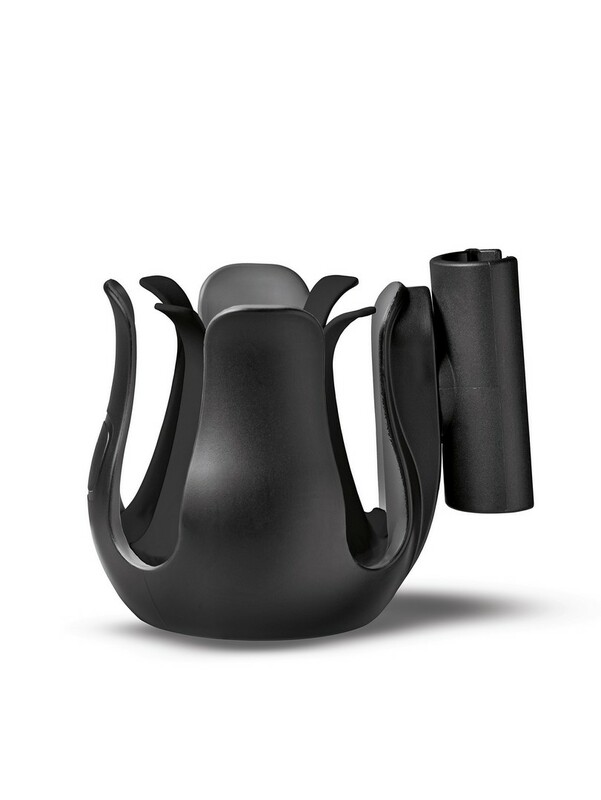 The tulip design of the Quinny Cup Holder clips onto your Quinny, allowing you to walk and sip your hot drink without spills. The Quinny Cup Holder can hold your child’s juice, too. Compatible with your Quinny Buzz Xtra Pushchair, Quinny Moodd Pushchair and Quinny Zapp Flex Pushchair. Get all these great Quinny Pushchair Accessories from BuggyBaby today. Keeping baby warm in low temperatures can be hard work. Blankets and bootees are easily kicked off by little legs, and can get trapped in your pushchair wheels. The BuggyBaby range of Quinny Pushchair Footmuffs & Cosytoes allow you to enjoy wintertime with your baby. For example, the Quinny Winter Liner, which encases your baby in soft, fluffy down to keep their whole body toasty warm. Or, for slightly older babies and toddlers up to age 2, the Quinny Footmuff keeps tooties toasty from winter walks to fireworks night. Compatible with Quinny Buzz Xtra Pushchair, and the Quinny Moodd Pushchair. Enjoy winter with your baby: check out Quinny Pushchair Footmuffs & Cosytoes from BuggyBaby today. Don't forget to check out our other great brands including Mountain Buggy, Britax, Maxi Cosi and Cosatto.